“What a picture they make. I’m so proud for us all. And the whole world can see. They’re our Jackie and John,” sings a character about Imelda and Ferdinand Marcos in the dazzling biographical musical Here Lies Love. That she is shown wearing a pink suit and a pink pillbox hat completes the imagery that captivated and outraged the population of the Philippines where the couple autocratically ruled for over 20 years until they were forced to flee. David Byrne conceived the show, wanting to explore “what drives a powerful person—what makes them tick? How do they make and then remake themselves?” Much of his lyrics and text are derived from original sources such as interviews, documentary and public speeches. He and his musical collaborator Fatboy Slim succeed tremendously in their goal of simulating the type of crowd-pleasing dance music that would be heard in a nightclub. They are also adept at traditional musical theater numbers and it all blends seamlessly into an accomplished unified score. 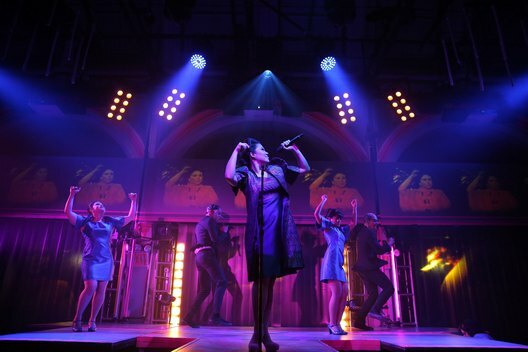 The Public Theatre’s LuEsther Hall has been reconfigured to resemble a nightclub where most of the audience stands to view the action which is performed all over the space on stages and platforms on all sides as well as platforms in the center that are moved by stage crew members. Young floor crew members in pink jump suits direct the audience to move around sometimes on stage and to encourage audience dancing and participation at appropriate times. There’s upper level seating away from the scene where one can sit and watch the events. The overwhelming projection design by Peter Nigrini beams slides, newsreel footage and simulated news footage of the characters onto the walls. There are also disco balls, strobe lights and smoke. The bombardment is purposeful as well as a replication of the sense of being in a nightclub as one can go in knowing nothing of the subject and be rapidly and thoroughly informed. Director Alex Timbers and choreographer Annie-B Parson create thrilling fast paced sequences that are vibrant visually. Most memorable is the production number featuring world leaders who paid homage to The Marcoses when they were in power. Cast members in rubber masks depicting Lyndon Johnson, Richard Nixon, Ronald Reagan and Mikhail Gorbachev cavort frantically. Clint Ramos’ remarkable costumes capture Imelda’s many looks from poverty to omnipotence. A raggedy housedress, furs, gold lamé and Jackie Kennedy style all dramatize her growing power. There’s no mention of her fabled shoe collection or any other easy campy targets. He outfits the rest of the ensemble with period simplicity and with over-the-top creations when needed. The scenic design of David Korins prodigiously fills the numerous playing areas with elements that take the story from many eras. The phenomenal lighting by Justin Townsend and sound design by M.L. Dogg and Cody Spencer are a huge factor in duplicating the experience of being in a nightclub. The music supervision by Kimberly Grigsby, musical direction by Justin Levine and musical editing by Matt Stine are all top notch. With her youth, beauty, peerless singing and great dramatic abilities, Ruthie Ann Miles as Imelda is the commanding anchor of the show. She captures all of the range and emotions of this reviled public figure and brings poignancy and humanity to the character, allowing the audiences to judge her. Jose Llana is authoritative as tyrannical dictator Ferdinand Marcos and here as he has demonstrated in his many other New York musical stage appearances is an incredible talent. The dramatic structure of the show gives great prominence to Benigno Aquino, Ferdinand Marcos’ political rival. Conrad Ricamora is charismatic as this white-suited idealistic hero. Singing and dancing dynamically, he often appears as a foil to the wickedness of the Marcoses. Flamboyant blond DJ Kelvin Moon Loh commandingly leads the terrific ensemble that portrays many characters over the course of the evening through different eras. David Byrne and his collaborators have created a unique musical theater extravaganza that dramatizes the life of this historical pop icon in all her victories and defeats. At the performance attended, this theater and all of the performing spaces at The Public were evacuated due to a fire alarm. Performers and audience members congregated across the street for about 20 minutes until without explanation everyone was readmitted into the building. The show soon begins again exactly where it left off with the cast performing with total commitment and with the interruption having no adverse effect.